Football's governing body Fifa should reconsider its decision to hold the 2018 World Cup in Russia, a senior Labour politician has said. Andy Burnham said he was not "comfortable" with the idea of Russia hosting the prestigious tournament after its annexation of Crimea. He told the BBC the West should send a "different message" that ordinary Russians would understand. The EU has extended travel bans on Russian officials and frozen assets. A further 12 individuals - both pro-Russian officials in Crimea and prominent supporters of Russian President Vladimir Putin - have been added to a list of those prevented from travelling to EU member states, taking the number to 33. After a meeting of EU leaders in Brussels, Prime Minister David Cameron said the EU had also agreed to rapidly implement economic, trade and financial restrictions on occupied Crimea. "We will only accept Crimean goods in the EU if they come from the Ukraine and not Russia," he said. The US and UK have also threatened wider economic and trade sanctions on Moscow in the event of any further attempts to "destabilise" Ukraine. Russia's continued membership of the G8 is also coming under scrutiny, with the likelihood that June's G8 meeting in the Russian resort of Sochi will be abandoned and G7 nations will meet without Russia. Mr Burnham, the shadow health secretary, said he supported these measures but believed the international community needed to think differently in how they punished Russia for its behaviour. "We have had the Sochi Winter Olympics. In 2018, we are all supposedly going to the World Cup in Russia. Are we comfortable with that idea? "Let's do something that actually the ordinary Russian on the street will understand. I can't understand how we can all say 'that's fine'. On every level we have to send a different message. "We have to be prepared to take him (President Vladimir Putin) on. It is Fifa's decision but I think they need to revisit it because you can't pretend that he is part of the club, strutting the world stage, and then take steps like this which are in fundamental violation of international law." Asked about the issue at a press conference in Brussels, Mr Cameron said it should be "left to the football authorities". Fifa general secretary Sepp Blatter rejected calls for Russia to be stripped of the tournament. "The World Cup has been voted to Russia and we are going forward with that work," he said. 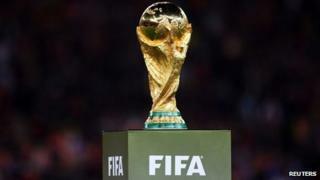 Russia was awarded the World Cup for the first time following a secret ballot of Fifa's 22 executive members in 2010, at the same time as Qatar was given the right to host the tournament in 2022. The UK bid for the 2018 tournament but only received two votes, one of them from the UK's representative on the committee, amid claims of backroom deals. In recent days, Qatar's World Cup organising committee has been forced to defend its bid to host the 2022 tournament following newspaper claims casting doubt on the process. It followed a report in the Daily Telegraph claiming former Fifa vice-president Jack Warner and his family were paid more than £1m by a company owned by an ex-football official from Qatar. Qatar's World Cup organisers said its bid committee "strictly adhered to Fifa's bidding regulations in compliance with their code of ethics" while Mr Warner has accused critics of a "foolish witch hunt" against the World Cup 2022 venue. Asked about the bid process in an interview with The Sun, Mr Cameron said he had be "careful" about what he said but he remained surprised at how little support the UK had received. "All I can tell you is that there are a lot of people who promised they were going to vote for me. And, in the end, I think we got just one vote." Pressed on how this had happened, he added: "I have to choose my words carefully. I would say (it was) "sorted" before we went into it."